Playable Super Mario Bros. in a shoebox? Genius! 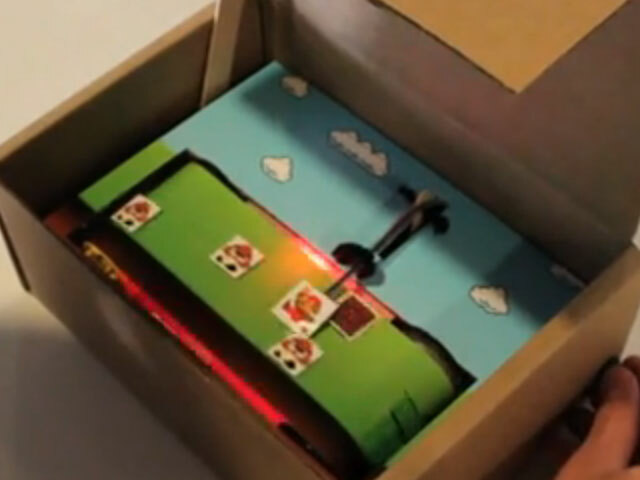 (CBS) - Maybe Nintendo can learn a thing or two about 3D gaming with this awesome homemade cardboard Gameboy. Okay - so it only plays one game, but it's still pretty nifty. The engineers (nerds) at Teague designed this to promote their new open source hardware platform Teagueduino. "Using a Teagueduino and a few inputs and outputs, we put together a physical side-scrolling video game," reads the video's description on Vimeo. "To control it, there's a knob on the side. As time advances the game gets faster and faster - can you avoid all the obstacles and make it to the end?" If this was for sale, we'd totally buy it.